A global assessment of flood events using the Dartmouth Flood Observatory (DFO) database is performed here to explore the planetary nature of the trends in the frequency and duration of floods (short, moderate, and long). 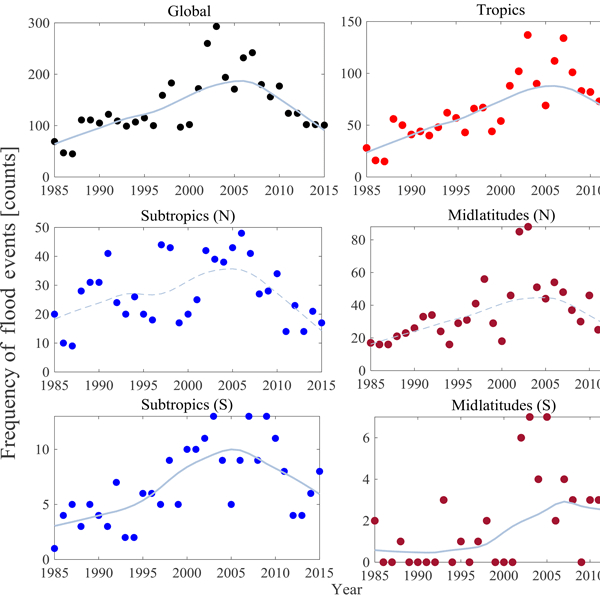 This comprehensive study is the very first global study of actual flood events which identifies temporal changes in frequencies and characteristics of probability distribution of flood durations to understand the changing organization of the local to global dynamical systems. We develop a hierarchical Bayesian (HB) model to reduce uncertainties in flood frequency analysis and explore suitable mapping function linking GEV parameters with drainage area. The results of HB model are compared with ordinary GEV model and index flood method.The application shows HB model provides more adequate confidence intervals than other used methods. This model also provides a better way for using fragmented data with varying lengths for analyzing spatial distribution of flood frequency. Floods are the main natural disaster in Brazil, causing substantial economic damage and loss of life. Here we seek to better understand the flood-generating mechanisms in the flood-prone Paraná River basin, including large-scale patterns of the ocean and atmospheric circulation. This study provides new insights for understanding causes of floods in the region and around the world and is a step forward to improve flood risk management, statistical assessments, and short-term flood forecasts. While water-risk management plans for economic assets are the norm on a local basis, it is possible that there is correlation in the climate induced portfolio water risk across operational sites. Therefore, from an investor's perspective, a need exists for a water risk index that allows for an exploration of the possible space and/or time clustering in exposure across many sites. This paper represents an attempt to develop such an index using long daily global modelled rainfall data sets. We examined the potential to use the basin-scale rainfall to directly model the streamflow and evaluate the effect of dam operations on summer flow risk over Yangtze River Basin. The result show that floods and droughts experienced in the post dam period were amplified, driven, or alleviated. The approach demonstrated here enabled one to develop and test both the rainfall induced variations and changes due to human activities on a river. This paper studies the nexus of air moisture, heavy rain and floods in the Northeast USA, with key research questions of how the moisture from the tropics move to the region, how they are related to heavy rain and floods in the area for different seasons, and what are the roles of atmosphere and climate. The study demonstrates the utility of statistics to understand physical system. It provides a statistically and physically based framework that similar studies can be conducted for other areas. Analyses of run lengths of Pacific decadal variability (PDV) suggest that there is no significant difference between run lengths in positive and negative phases of PDV and that it is more likely than not that the PDV run length has been non-stationary in the past millennium. This raises concerns about whether variability seen in the instrumental record (the last ~100 years), or even in the shorter 300–400 year paleoclimate reconstructions, is representative of the full range of variability. This work observes that the result of streamflow simulation is often biased, especially with regards to extreme events, and proposes a novel technique to reduce this bias. By using parallel simulations of relative streamflow timing (sequencing) and the distribution of streamflow (magnitude), severe biases can be mitigated. Reducing this bias allows for improved utility of streamflow simulation for water resources management. Three-dimensional geological models are important to securing and managing groundwater. Such models describe the geological architecture, which is used for modeling the flow of groundwater. Common geological modeling approaches result in one model, which does not quantify the architectural uncertainty of the geology. We present a comparison of three different state-of-the-art stochastic multiple-point statistical methods for quantifying the geological uncertainty using real-world datasets. 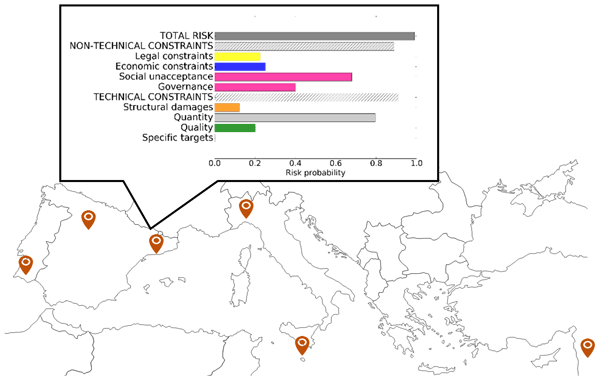 In this work, we have developed a methodology to evaluate the failure risk of managed aquifer recharge, and we have applied it to six different facilities located in the Mediterranean Basin. The methodology was based on the development of a probabilistic risk assessment based on fault trees. We evaluated both technical and non-technical issues, the latter being more responsible for failure risk. 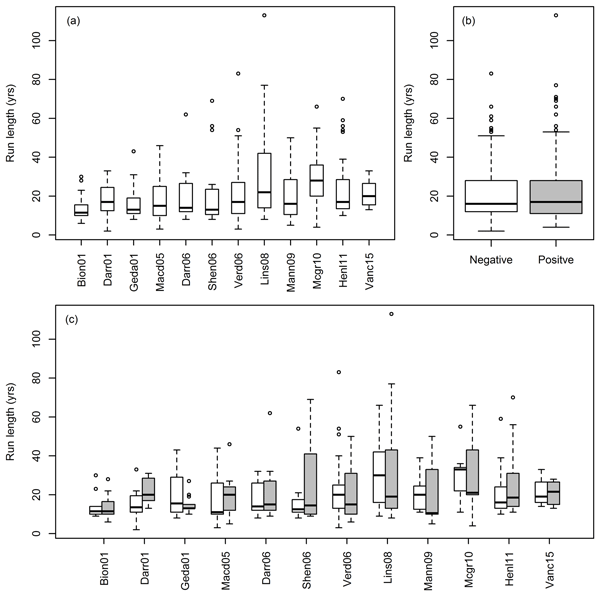 In this paper, stochastically generated rainfall and corresponding evapotranspiration time series, generated by means of vine copulas, are used to force a simple conceptual hydrological model. The results obtained are comparable to the modelled discharge using observed forcing data. Yet, uncertainties in the modelled discharge increase with an increasing number of stochastically generated time series used. Still, the developed model has great potential for hydrological impact analysis. Assuming that floods are driven by both short- (meteorological forcing) and long-term perturbations (higher-than-usual moisture), we propose a technique for updating a season in advance the flood frequency distribution. Its application in the Po and Danube rivers helped to reduce the uncertainty in the estimation of floods and thus constitutes a promising tool for real-time management of flood risk mitigation. This study is the result of the stay of the first author at the University of Bologna. In northern China, rivers run dry and groundwater tables drop, causing economic losses for all water use sectors. We present a groundwater-surface water allocation decision support tool for cost-effective long-term recovery of an overpumped aquifer. The tool is demonstrated for a part of the North China Plain and can support the implementation of the recent China No. 1 Document in a rational and economically efficient way. One of the most promising alternatives to improve the efficiency in water usage is the implementation of scarcity-based pricing policies based on the opportunity cost of water at the basin scale. 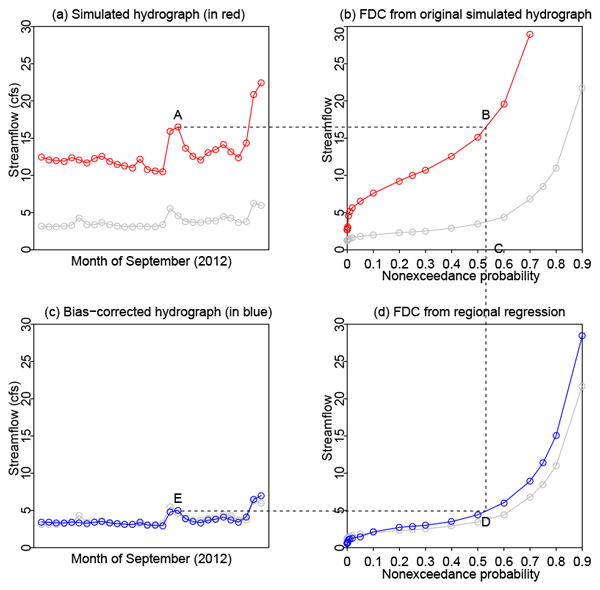 Time series of the marginal value of water at selected locations (reservoirs) are obtained using a stochastic hydro-economic model and then post-processed to define step water pricing policies.